Since October is Down Syndrome Awareness Month, it seems a good time to look at what it means to have Down syndrome. First of all, what does the name mean? Langdon Down was a physician who first identified characteristics of people previously called Mongoloid, due to the slanted eyes seen in natives of Mongolia. Down is capitalized because it is a proper noun; syndrome is not because it is a list of identifying characteristics seen in a particular population. Because of the similarity of physical characteristics, it is frequently assumed that children and adults with Down syndrome are always alike in other ways. The truth is that they may be quite different in personality, temperament and intelligence. The video displayed is a good way to look at these individual differences. My son Billy, for example, was raised in a family with three other children, a father of German descent, raised in the mid-west, and a mother of English-Scotch-Irish descent, raised in the south. He has characteristics of both parents and a personality of his own. 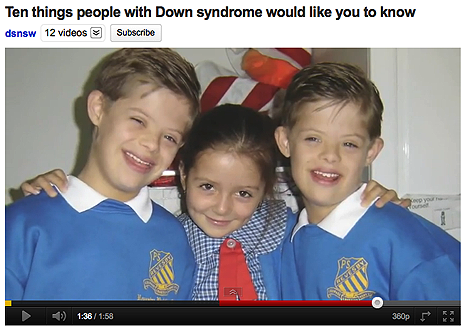 If you have questions about Down syndrome or Billy, I will be happy to answer them. If you have specific questions about the causes and demographics of Down syndrome, you can Google Down syndrome and find numerous sources.